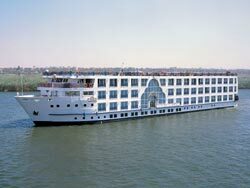 The Cruise boat built according to the latest international specifications is a modern cruise boat, 72 mts long and 14.20 mts wide. Conceived with 4 main decks plus sundeck, the cruise boat has 72 superior cabins in modern style, all with wide windows, telephone, mini bar, air-condition, in-room safe box, satellite TV and courtesy set. Cabin size starting from 15 up to 38 sqm.